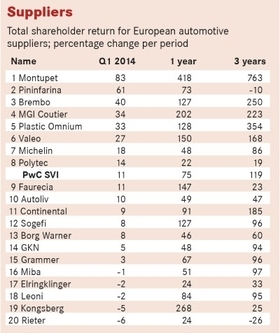 The value of European automakers, suppliers and retailers showed further improvement in the first quarter of this year, although the pace of growth was slower than in the preceding three months, according to the Automotive News Europe/PricewaterhouseCoopers Transaction Services Shareholder Value Indices. The 7 percent rise in the value of automakers was two percentage points less than in last year's Q4, while an 11 percent rise in the value of European parts suppliers followed a 15 percent gain in the preceding quarter. By contrast, the 5 percent improvement in the value of auto retailers was a small improvement on the 2 percent recorded in Q4. 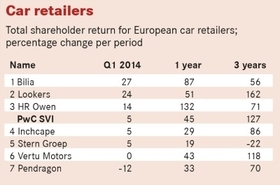 Peugeot was the top performer during the first quarter with a 45 percent gain in shareholder value. That was a big change from the final quarter of Q4 when its shareholder value was down by 22 percent. The French company got a boost from a 1.4 billion euro rights issue and the acquisition of two 14 percent stakes in the carmaker by Chinese partner Dongfeng Motor and the French government. Each injected 800 million euros into PSA. New CEO Carlos Tavares has promised to grow in China and to cut waste at its money-losing French operations. 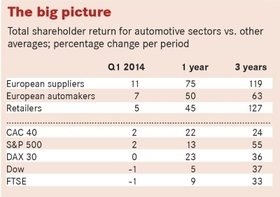 Fiat and Renault also showed strong gains during the quarter. Following the acquisition of Chrysler in January, Fiat CEO Sergio Marchionne said the Italian automaker would have the potential to boost annual deliveries by as much as 55 percent to 7 million vehicles following the merger. Largely driven by sales of trucks and SUVs, Chrysler's sales have outpaced those of nearly all its competitors in a relatively sluggish U.S. new-car market. In stark contrast, VW Group relinquished 7 percent of shareholder value, dropping from second place in Q4 last year to become the only automaker in the table to lose ground in Q1 this year. “The overall growth for European automakers is encouraging and reflects the tentative recovery in the euro zone, driven by a combination of pent up demand and the success of refreshed and expanding model ranges.” said Jason Wakelam, PwC Automotive Transaction Services Partner. French cylinder head specialist Montupet was the star performer among suppliers. Its value rose 83 percent following a good performance in 2013 and further anticipated growth this year on the back of a strong order book. Italian design and engineering specialist Pininfarina also performed well, up 61 percent in value due to improved 2013 sales and an anticipated return to profit this year. “European component suppliers are benefitting from the drive to localize production within Europe by a number of the large automakers, combined with the increase in overall volumes,” Wakelam said. Amongst retailers, the top two performers were Sweden’s Bilia, up 27 percent, and UK multi-franchise dealer group Lookers, up 24 percent. 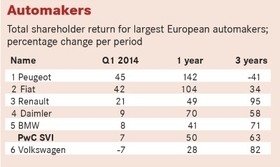 Bilia benefited from a strong 2013 and a positive outlook for Scandinavian markets for 2014. Higher sales at improved margins, for both new and used cars, resulted in better-than-expected results at Lookers.